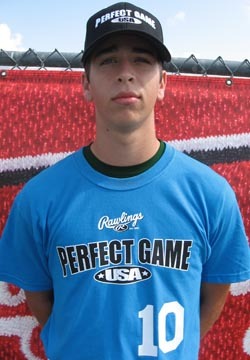 John Sokolowski is a 2009 RHP/3B/SS with a 6'1'', 170 lb. frame from Lawrenceville, GA who attends Collins Hill. Athletic build, smooth easy delivery, high 3/4 arm slot, good life to fastball, armside run, good spin on 11 to 5 curveball, efficient with his pitches, creates lots of groundballs, good bat speed at the plate, consistent hard contact, turns on the ball well, calm hitting approach, nice extension, ball jumps off the bat some, raw arm strength in the field, online throws, good range, sound actions, very strong student.